SHINZO ABE, Prime Minister of Japan, strongly condemned the conflict in Syria, saying that Japan’s people were shocked and angered at the use of chemical weapons against civilians. As a matter of urgency, he said that his country called for an immediate cessation of violence, initiation in political dialogue and an improvement in humanitarian conditions. He said that Japan would continue to extend a helping hand to the internally displaced persons and refugees, as well as provide medical equipment and training of medical staff. He noted that Japan would provide approximately $60 million in additional humanitarian assistance to Syria and neighbouring countries. Repaying the good fortune of being selected to host the 2020 Olympic and Paralympic Games, Japan sought to rebuild its economy in order to make it a “dependable force for good in the world,” he said. 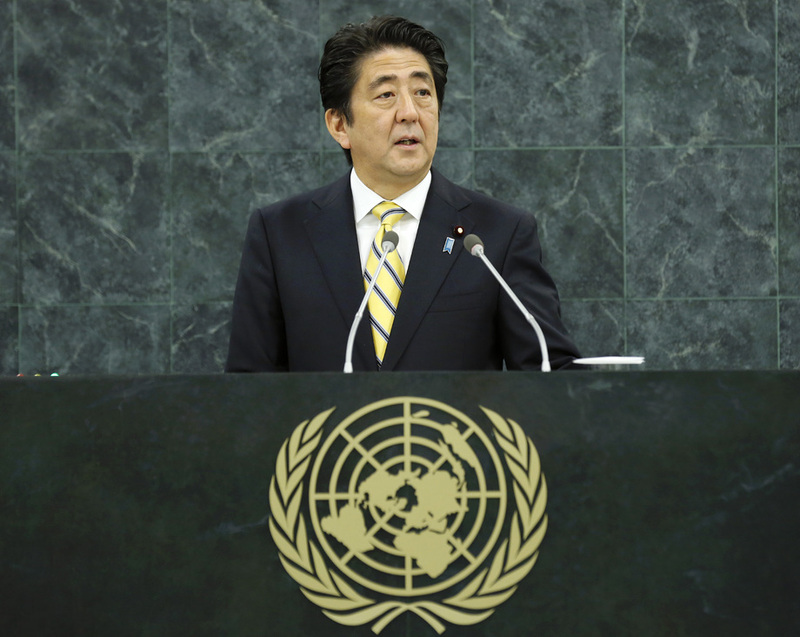 As a proactive contributor to peace, Japan had been also actively promoting the concept of “human security” in United Nations collective security measures, including peacekeeping operations. Since national interests were firmly connected to the stability of open seas, changes to the maritime order through the use of force or coercion could not be condoned under any circumstance, he said. Preserving public spaces ranging from outer space and cyberspace to the skies and the seas as global commons governed by rules and laws were imperative for Japan. As a country that understood the horror and devastation wrought by atomic weapons, Japan could not condone North Korea’s nuclear and missile development and demanded that North Korea returned every Japanese national it had abducted. As for Iran’s nuclear issue, Japan hoped that the new administration would take concrete actions to address it. On Japan’s involvement in the development of Africa, he highlighted the outcome of the fifth Tokyo International Conference on African Development, where African leaders repeatedly expressed great eagerness to welcome private sector investment. He then mentioned the need to reform the Security Council and emphasized Japan’s aspirations to become a permanent member. On restarting the country’s economy, he said that the answer lied in the theory called “womenomics”, which asserted that the more women are advanced in society, the higher the growth rate would become. Creating an environment in which women find it comfortable to work and enhancing opportunities for them to be active in society, he continued, would create a “society in which women shine”. He pledged financial and diplomatic support to United Nations Entity for Gender Equality and the Empowerment of Women (UN-Women), especially on the issue of sexual violence against women, as well as protection of women in natural disasters. To clarify the country’s development concept aimed at creating a “society in which women shine”, he provided three examples. First, he spoke of Ms. Tokiko Sato, a Japanese aid specialist, who dedicated her life to improving maternal, newborn and child health in a remote village in Jordan. Being these three areas where attainment of the Millennium Development Goals had been slow, Japan promised greater efforts in the field of health and medical care for women. His second example was Ms. Nilufa Yeasmin, from Bangladesh, who, working as a salesperson and instructor on the use of a Japanese water depurative system, showed the benefits of promoting women’s participation in society. He continued by citing that inventive efforts, as well as launching start-up businesses in Africa, became consequently a priority area in Japan’s policy. The last example was Ms. Islam Bibi, an Afghan police officer who guarded polling stations in order to monitor elections and who was recently assassinated. Her example showed the importance of women’s participation and protection in the areas of peace and security. He stated that: “ Japan intends to make efforts towards measures that will ensure the participation of women at all stages, including the prevention and resolution of conflicts, as well as peacebuilding, safeguarding the rights and physical well-being of women who are exposed to danger in times of conflicts.” He concluded by saying that, in establishing these three pillars, Japan would implement official development assistance (ODA) in excess of $3 billion over the next three years.